The RX1 Traxxis Mini Dirt Bike was born to conquer all terrain, smooth or rough. Retaining its pocket bike size, this mini dirt bike can tackle everything the path can throw at it. Built with toughness and durability in mind, everything has been reinforced for heavy duty trailblazing. The main frame and sub-frame has been forged together with powder coated black High Tensile Strength Steel. Its Full Suspension System is designed to give the RX1 Mini Dirt Bike maximum ground clearance while soaking up all the bumps the road can dish its way. The off-road duty spring rates were also calibrated to give you maximum control and handling in the most extreme conditions, whether that is going down a steep dirt trail or carving up some pavement. Heavy duty disc brakes, front and rear, provide all the stopping power needed to halt the Traxxis Mini Dirt Bike on a dime. See a pothole on your path? While other bikes go around it, the RX1 Dirt Bike goes through it! A regular street pocket bike engine won't do! A new engine was designed for this specific off road bike. A Honda®-Based 4-STROKE race-tuned engine is fitted to a dirt bike this size for the very first time. A 4-STROKE engine is needed for bottom end power when going off-roading. And 4-Strokers are quieter and more fuel efficient to take you deeper into the woods and back! Gearing has also been optimized for maximum low RPM power. With a newly designed hidden straight-pipe exhaust system, this engine will rev up to 10,000 RPM's, just like our road going pocket bikes. Knobby Off-Road all terrain tires and super impact resistant fairings top off this Mini Dirt Bike's list of features. Adjustable angle handlebars, brake levers and heavy duty foot pegs come pre-installed along with an adjustable top speed limiter. Our RX1 Traxxis Mini Dirt Bike comes nearly fully assembled and ready to blaze new trails! 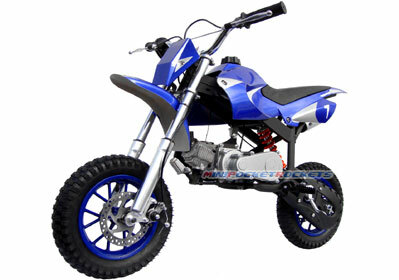 EPA APPROVED & CERTIFIED - OUR MINI DIRT BIKES ARE THE ONLY ONES LEGAL IN ALL 50 STATES! Included Free with Mini Dirt Bike: Owner's Manual, Bike Kick Stand, Tools, Tool Case, Motor Oil Bottle, Starter Stickers and our free extended warranty.